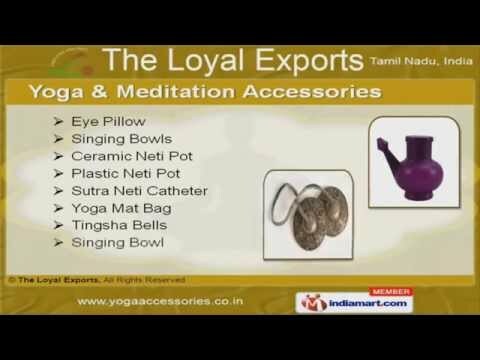 Welcome to The Loyal ExportsManufacturer & Exporter of Yoga ProductsThe company was established in 2002, at Karur. Our Well equipped infrastructure unit & Goodfinancial position help us to serve America, East Europe, North Europe & other countries. Assured quality, Affordable prices, Customization & timeliness are the pillars of ourorganization. We offer a splendid range of Meditation Cushions, Yoga & Meditation Accessories. Tingsha Bells, Singing Bowls & Ceramic Neti Pots are available under Yoga & MeditationAccessories. Rectangular Bolster, Yoga Strap, Bolster & Pranayama Pillows are some of the types of YogaProps & Blankets. Our Yoga Rugs & Wear are widely appreciated in the market. We also provide Meditation Cushions that are best in terms of quality. Along with that we offer Zafu & Meditation Cushions that are extremely reliable.